Bayou La Batre, August, 2011 - Horizon Shipbuilding, Inc., Bayou La Batre, AL, has delivered the third in a series of 120’ Towboats to Florida Marine Transporters of Mandeville, LA. The M/V Brees joins her sister ships, M/V’s Capt. W. D. Nunley and Capt. Kirby Dupuis in pushing cargoes throughout the inland waterways of the United States. 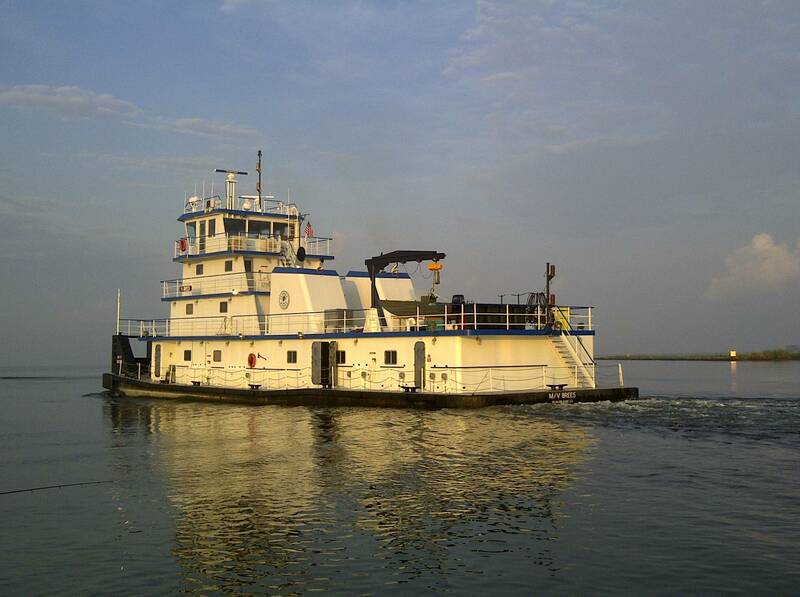 “This boat is a true workhorse,” said Ben Forrest, Project Manager for the M/V Brees. “There were some challenges that we had to overcome during production because of the larger propulsion package but our guys really stepped up. The boat ran great during sea trials and will be going to work immediately, which is a reflection of the superior skill of our craftsmen.” Named after Superbowl XLIV Most Valuable Player, Drew Brees, the M/V Brees boasts nearly 5000 HP making it one of the most powerful towboats of its size. Like its sister ships, the M/V Brees was designed by John Gilbert and is 120’ long by 35’ wide with a 10’ draft. The towboat is four-decked and is outfitted for service in areas restricted to overhead clearances and draft limitations. She is powered by two 2,450 hp C280 Caterpillar engines coupled to Lufkin reduction gears. Ten inch shafts turn five-blade, stainless steel wheels manufactured by Sound Propeller Services, Inc. that are mounted in kort nozzles for maximum efficiency. Auxiliary power is supplied by two 175 kw Caterpillar C9 generators. Horizon Shipbuilding, Inc. (Horizon) is a “best value” shipyard specializing in the design and construction of ships, boats, and barges up to 300' in length and 1500 tons launch weight for domestic and international clients. Its proven customer base includes tug and barge operators, the offshore oil industry, cruise and diving industry, and specialized craft for the United States and foreign governments. Additional information can be found at www.horizonshipbuilding.com.